If we were to use one word to describe Moontower Rentals, we would cheat and use a hyphenated word: design-forward. To us, design-forward event rentals are pieces that aren’t just functional and can’t be found just anywhere. Design-forward event rentals attend to the details, calling for a closer look to truly appreciate the piece. Today we’re featuring a hand painted palm French 75 accent table that fits the description of a design-forward event rental. It’s completely functional as a dessert/serving table, guest card table or sweetheart table, but it’s the “hand painted” aspect that really sets it apart. We currently have 3 of these beauties, which goes to show that you cannot rent this table from just anywhere. This particular piece was most recently used for the inaugural Euphoria Fest Weddings (where these gorgeous photos are from), serving as an accent table to add a pop of color that made the presentation go from regular to excellent! The hand painted palm table was a perfect fit for the event, which took place at Carson Creek Ranch in Austin, TX from April 6-9th. Seven different wedding ceremonies occurred over the span of the weekend, with each bride and groom bringing their own personal style down the aisle. These couples all opted for a spontaneous and out-of-the-box way to tie the knot and the setting definitely needed to match! Which is why we brought out our quirky little hand painted palm French 75 accent table for the occasion. Euphoria Fest Weddings called for unique and design-forward rentals and Coley of Three of Cups did a fantastic job designing the ceremony and reception space. 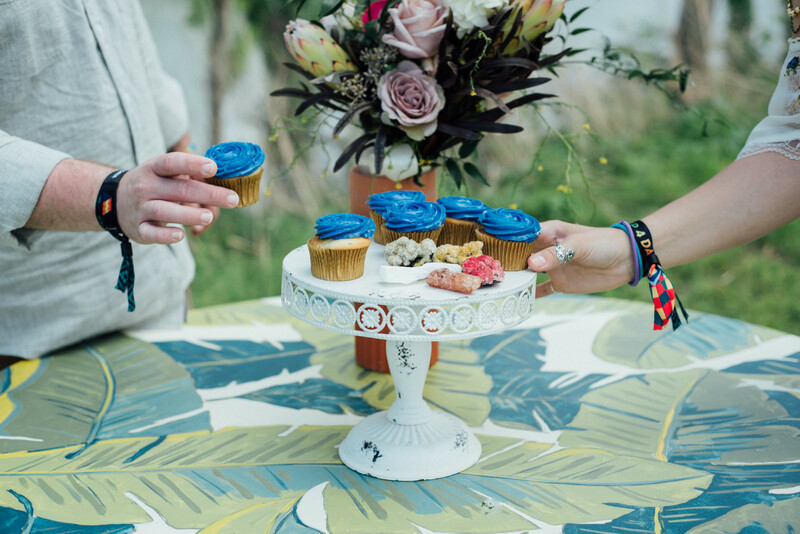 The goodies on top of our accent table were from Bribery Bakery and complemented everything perfectly. The photos below were taken and provided by Ben & Laura Photography. To bring this design-forward hand painted palm French 75 accent table to your event, click here and add to your Moontower Rentals wishlist!